Palazzo Incontro on Via Prefetti - just around the corner from Montecitorio and Palazzo Chigi – is an eighteenth-century palace which the Province of Rome reopened to the public in 2005 as an art gallery after a long restoration. It still retains something of the new kid on the block feel as a public exhibition space and the current photography show - Exactitudes by Rotterdam based photographers Ari Versluis and Ellie Uyttenbroek - is a quirky and rigorously contemporary choice which can only help strengthen its aspirations of becoming an important exhibition space in the city. 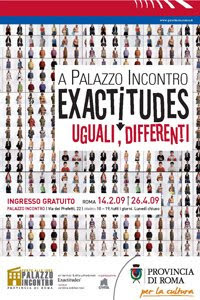 Exactitudes® – a linguistic invention which marries the English words exact and attitude – consists of a series of systematically documented photographic portraits of individuals, all standing in similar poses and all observing strict dress codes, who are then categorized according to the group identity they best fit. The current selection features the 112 groups which artist Ellie has called their “butterfly collection” - indeed, the whole effect feels almost scientific in its anthropological recording of modern society. Leaving the gallery and stepping outside it was hard not to start categorizing just about everybody one met on the streets of Rome!